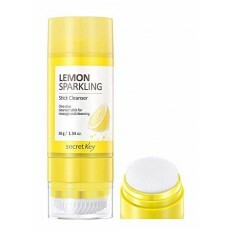 Secret Key Lemon Sparkling Stick Cleanser is your one step cleansing stick that massage and cleanse at the same. It contains a natural yellowish colored balm that glides smoothly on the face which eventually creates a foam to remove makeup, dirt and excess sebum. The other end of the stick is a built in silicon brush that softly massages the skin and effectively aids in unclogging hidden and stubborn dirt kept inside your pores. Twist the cleansing stick until the balm comes out. Glide softly on dry face. Now invert the stick so that the built in brush is on top. Moisten a bit with water, then massage on face until foam is created. Rinse face thoroughly. Follow with your toner.